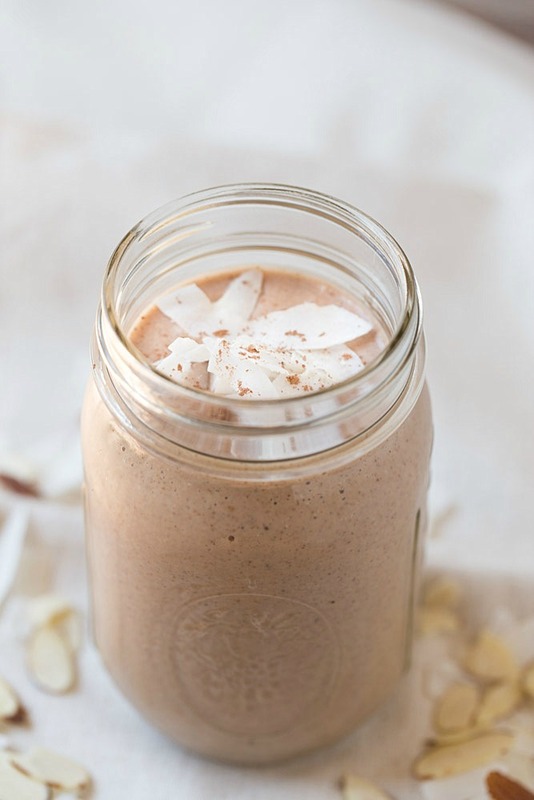 A simple breakfast recipe: Almond Joy Protein Shake. Great meal replacement at 460 calories. This smoothie keep you full until lunch. Vegan friendly. I took the plunge and decided to give plant based protein powders a try. One of the first things I made with the chocolate protein powder was this delicious Almond Joy Protein Shake. It’s the perfect balance of chocolate, almonds and coconut and will give you your sweets fix in the morning without having to hit the donut shop! I know I always say I’m going to quit eating dairy or cut back on it but I just cannot detach myself from cheese and lattes made with dairy milk. I’ve tried soy, I think it gives me hot flashes. For real. Coconut milk makes the lattes taste too sweet and almond milk, well I haven’t gone there yet when it comes to lattes. I’m afraid. Someone told me it makes a latte taste like sawdust. I don’t want to waste my money on a sawdust tasting latte. One type of dairy product I can steer clear of is whey based protein powders. I just do not like them so it makes it easy for me to avoid them. One less dairy product that could wreak havoc on my stomach. This is how plant based protein powders entered into my life. I wanted to make some protein boosted meals and smoothies so I got to researching plant protein powders and settled on both chocolate and vanilla from a company I’d never heard (Garden of Life) of but they got good reviews so I took a chance on them. 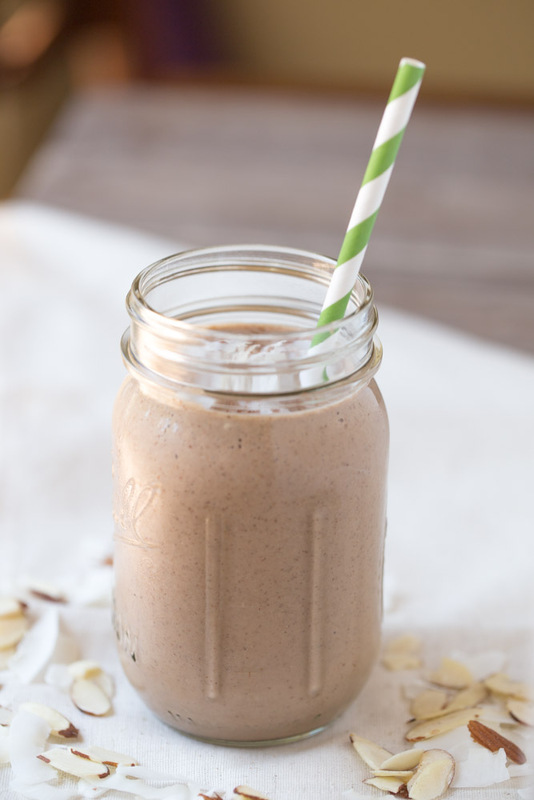 This Almond Joy Protein Shake is worth sipping on, too. I enjoy them for breakfast but you could totally have one to get those mid-afternoon chocolate cravings satisfied. Everything is placed into a blender and blended until mostly smooth. The coconut usually doesn’t totally blend so there will probably be small pieces of coconut in the shake. But that’s ok because we are talking about coconut here. Coconut can do whatever it wants to do. This protein shake can be made ahead of time, placed into a jar or cup with a lid and placed in a fridge until ready to drink. 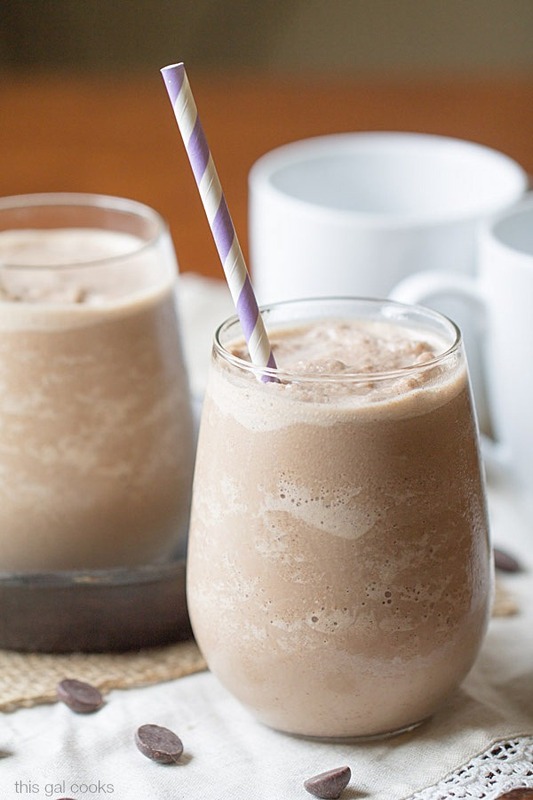 BUT, this protein shake is really quick to make so it’s a great one for busy mornings, too! Place all items in a blender. Pulsate a few times and then blend on medium high speed for 1-2 minutes. If using a Ninja blender, use speed 7. You can easily double this recipe, if desired. What a delicious shake! Almond Joy is my favorite candy bar so I know I would love this! 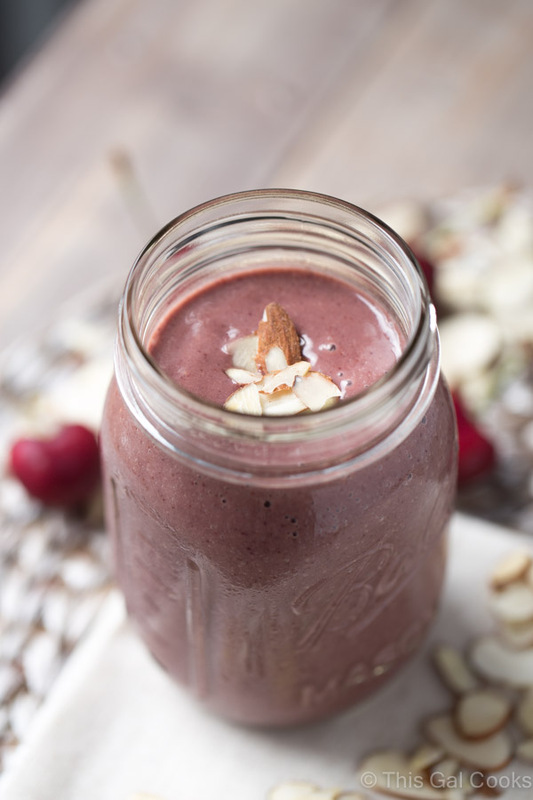 This smoothie is just beyond gorgeous, Julie! So wish I could be sipping on one of these right now! I started using plant based protein powders a couple of years ago and I feel so much better on them. of course, I don’t make anything this elaborate with my shakes, I’ll have to try this! 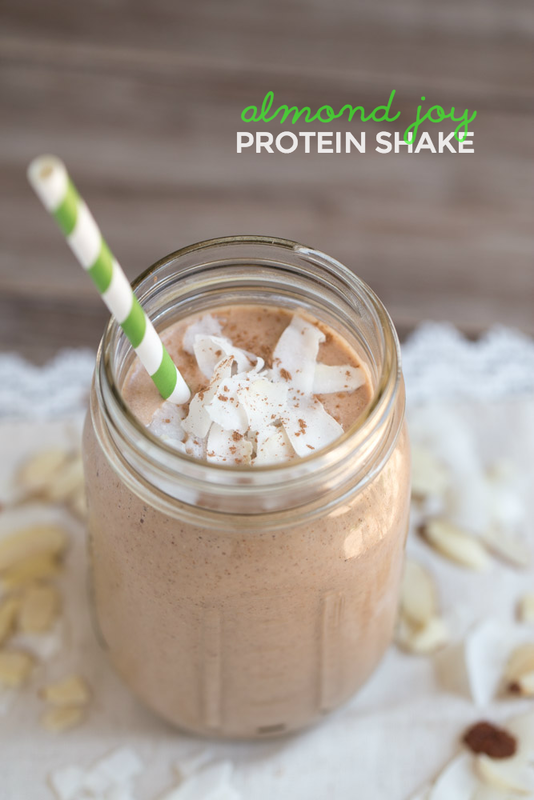 I need a new shake in my rotation and almond joy happens to be one of my very favorite candies, so this shake needs to happen! I’m totally with you on whey proteins, they make my stomach hurt! Love the sound of this smoothie. Perfect after-workout breakfast! I wouldn’t mind some protein in the morning to help me survive the day. 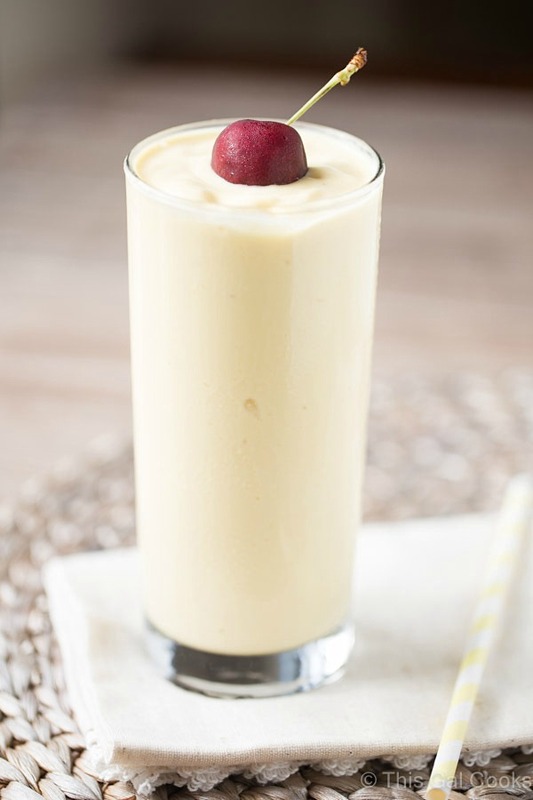 And this shake is so refreshing! Almond joy is my favorite. And having your favorite in the morning isn’t bad at all, right? Absolutely great shake! Thank you for posting this vegan protein shake recipe! I want to try out some plant-based protein supplements as well and this sounds delicious. I’ll try making this pre-workout and see how it goes for me. What types of plants are the proteins usually extracted from for these drink mixes? You’re welcome! I hope you enjoy the recipe. I use this plant protein – http://www.gardenoflife.com/Products-for-Life/Organic-Plant-Protein.aspx – which says it’s made with pea seed, flax seed, cranberry seed, chia seed and pumpkin seed. I’m not sure what types other brands use as I have not used any other brands.